Radio and TV presenter Anne Diamond visited the museum on 4 May, a week after interviewing chairman Richard Poad about royal visits to Maidenhead. 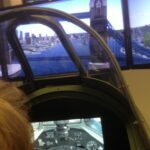 But this time she came to fly our Spitfire simulator – and what fun she had. The photos show Anne with volunteer flying instructor Bernie Kuflik and the view from the cockpit as she approaches Tower Bridge at high speed. She flew the Spitfire cleanly through the centre of the bridge. Well done, Anne!